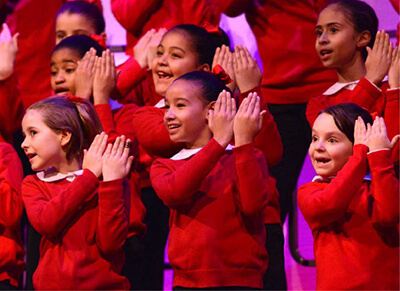 YPC’s Community Chorus Program began in 2012 when Artistic Director/Founder Francisco J. Núñez established the first community chorus in Washington Heights to provide more children with the opportunity to participate in YPC’s award-winning choral program. In 2015, YPC established its second community chorus at the Goddard Riverside Community Center on the Upper West Side. The program is overseen by YPC Assistant Conductor Maria Peña. Children in YPC community choruses attend after school rehearsals led by YPC-trained conductors and professional accompanists. Each chorus performs concerts throughout the year within their community and throughout New York City. Rehearsals are hosted by YPC Community Partners. Boys and girls, ages 8-10, rehearse Thursdays from 4:00-5:15 p.m. 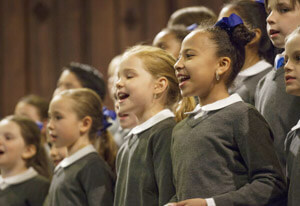 Boys and girls, ages 10-13, rehearse Thursdays from 5:30-6:45 p.m. Boys and girls, rising third to sixth grade, rehearse Tuesdays from 4:30-5:45 p.m.
To request an audition, please complete the audition application. For more information, please email audition@ypc.org or call the Chorus at 212-289-7779. Scholarships are available as needed.